As I mentioned in my last post about sunscreen, this summer I have several sunscreens on rotation depending on my mood and my needs. Each of these formulas is different and impressive in its own way, but they all have one thing in common: They absorb quickly and feel comfortable on the skin. 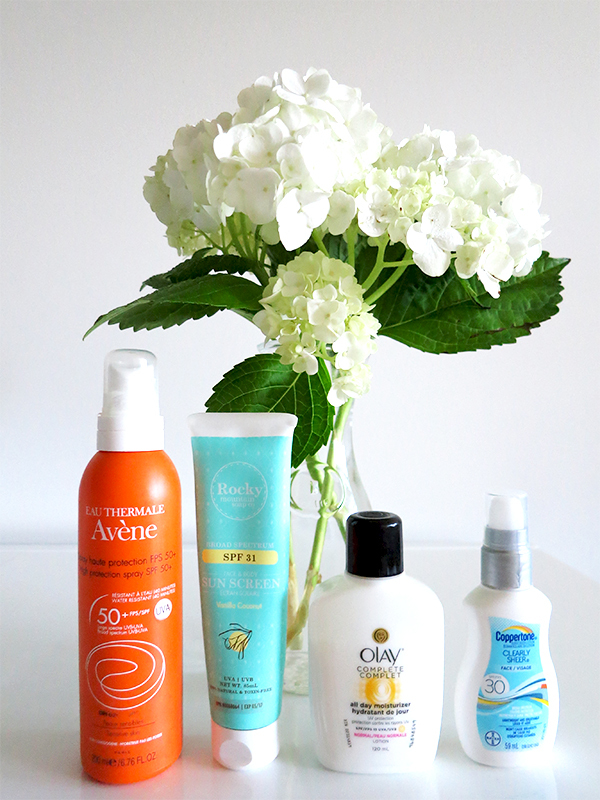 I was first introduced to Avene High Protection Spray for Sensitive Skin SPF 50 ($32.50 at London Drugs) by a beauty PR last year, and it became my 24/7 all-summer sunscreen. In fact, I loved it so much that when we started getting summery weather early this year in May, I promptly bought a new bottle. This thin, lightweight blend of chemical sunscreens is more like a sunscreen milk than a true lotion or cream, spreading over skin with ease. It feels light and non-greasy but hydrating at the same time (probably thanks to the soothing French thermal spring water in the formula), and because it's formulated for sensitive skin I feel fine using it on the face or body. The high SPF broad spectrum protection makes me feel safe if I slack on re-application during a typical week day zipping to and from the office, but if I'm spending the day at the beach or park and diligently re-applying every 2 hours, it's potent enough to protect from wicked sunburns. (Bonus: it's water-resistant up to 40 minutes!) If you only buy one sunscreen this summer, make it this one. Seriously, what can I say about Rocky Mountain Soap Co. SPF 31 sunscreen ($22) that hasn't already been said here? If you're set on using a natural sunscreen this is an excellent choice. When the Coppertone Clearly Sheer Face SPF 30 lotion ($8.99 at London Drugs) says it's lightweight and breathable and won't clog pores or cause breakouts, it means business. The moisturizing lotion dries to a matte finish, smells faintly of coconut, and literally feels like nothing on the skin once applied. The texture of sticky sunscreens always puts me off re-applying throughout the day (who wants to slather on something icky and oily on a hot day? ), but the invisible texture of this one would encourage me to touch up my SPF throughout the day, even over makeup. The 59 ml pump bottle is small enough to fit in any purse or tote too. I love that it's still light out in the evenings as I'm leaving my Bar Method classes, but that also means I still need some sort of UVA/UVB protection. Olay Complete All Day UV Moisturizer Lotion SPF 15 ($9.59 at London Drugs) combines hydration and vitamins B3, C, and E with SPF 15. While I usually consider SPF 15 too low for daily use—especially in the summer—it seems sufficient for the PM hours post-workout and before sunset when the sun's rays are still present but aren't as strong. In the days leading up to our wedding, I'm being extra careful about the products I test in case they trigger breakouts, but this Olay moisturizer is oil-free and non-comedogenic, and it feels light and comfortable and non-greasy. I feel great when I shower and cleanse my face after a sweaty barre class and I apply this (thereby moisturizing and protecting my skin in a single step), just easy breezy and comfortable in my own skin. 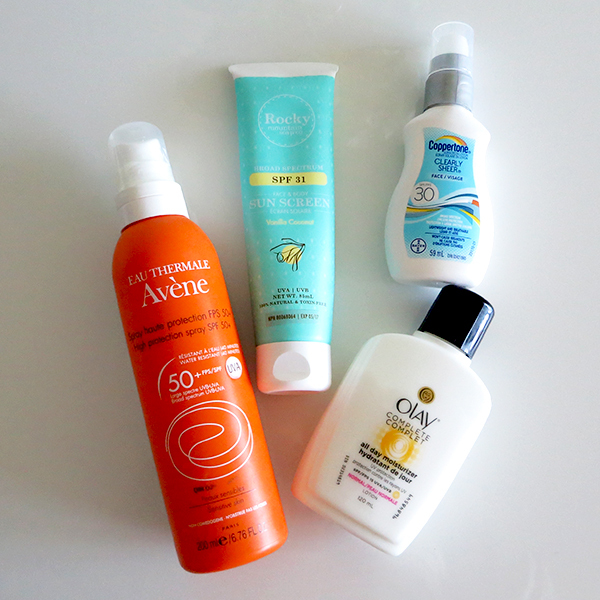 What are your favourite sunscreens?